Heat oven to 425ºF. Line cookie sheet with parchment paper. In 2-quart saucepan, heat milk, 1/2 cup butter and the salt until butter is melted. Add flour all at once; stir until mixture comes together, forms a ball and pulls away from side of saucepan. Transfer dough to food processor. Add eggs; process until dough is combined and smooth. Using ice cream scoop, place balls of dough on cookie sheet. Bake 20 minutes or until golden brown. Turn oven off; let stand in oven 10 minutes longer. Cool completely. Meanwhile, beat whipping cream with electric mixer on medium-high speed until slightly thickened. Reduce speed; beat in 2 tablespoons sugar and the chai latte mix. Increase speed; beat mixture until stiff. Cover; refrigerate until ready to use. In 2-quart saucepan, stir together 1/2 cup sugar, the cornstarch and cocoa with whisk. Add water; heat to boiling over medium heat. Boil 1 minute. Beat in 2 tablespoons butter. Remove from heat; stir in vanilla. Pour into heatproof jar. Store in refrigerator. 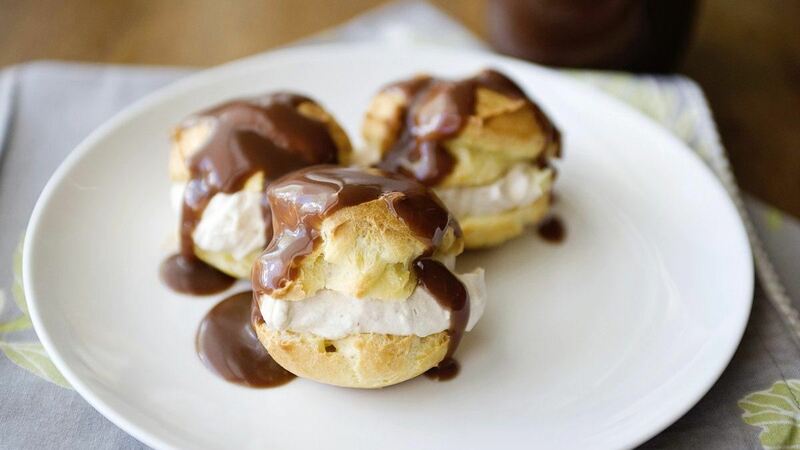 To serve, cut each cream puff in half. Top bottom halves with chai latte whipped cream. Cover with top halves of cream puffs. Drizzle each with chocolate sauce. Make Ahead: The profiterole shells can be made in advance. Store in an airtight container for up to 2 days or freeze in freezer plastic bags. Tip: You can fill profiteroles with flavoured whipped cream or ice cream. They are incredibly versatile.